Today, this tradition is carried on in many countries of the world. In England, friends often write messages and dates on the eggs they exchange. In France, children are told that the Easter chimes bring their eggs. German children believe that the Easter rabbit hides the eggs they find in their gardens. On Easter Monday, the young people have an egg-rolling contest called Bieriesen. The winner gets a prize of 101 eggs! In Italy, eggs are placed at the center of the Easter table and the other foods are arranged around them. In Greece, people tap red eggs together as an Easter greeting when they meet. The people of the Ukraine are famous for their beautifully decorated Easter eggs. Their brilliant colors and intricate geometrical designs are true works of art. In the USA children and adults alike enjoy painting and dyeing eggs at Easter time. Some paint faces on the eggs and dress them in funny paper hats. Others cover their eggs with flowers, cellophane or ribbon, or write names on them. Whatever the custom, the simple egg brings joy to many at Easter time! The custom of exchanging Easter eggs began in ancient times. 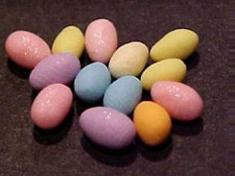 Egyptians and Persians often dyed eggs in spring colors and gave them to their friends as gifts.